ActionSportGames is a worldwide leader in the business of replica firearms and accessories manufacturing - including Airsoft guns, Airguns, Co2 guns and firearms replicas. They specialize in 1:1 scale replica guns and accessories for fun, action, sports, entertainment and collection. The assortment consists mainly of licensed models and exclusive sub brands of ActionSportGames. ActionSportGames was founded in April 2003 as a merger of the two largest Danish distributors of Airsoft Guns and accessories, Pedersen & Grobelnik A/S (founded 1992) and Vestergaard ApS (founded 1960). One of their goals is to become the preferred supplier in the firearms replica business through worldwide license agreements, quality brands and premium service. 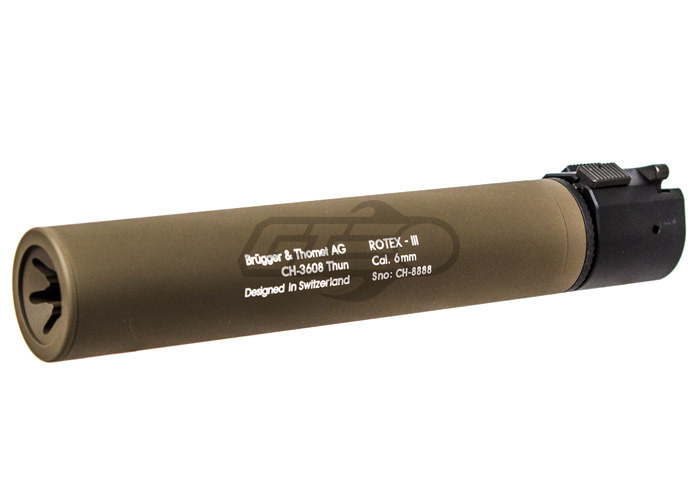 The ASG B&T ROTEX-III barrel extension tubes are fully licensed replicas of silencers from B&T AG. Of Switzerland. Made from aluminum and steel with authentic markings in a new design. Each barrel extension tube comes with a steel flash-hider (14mm counter clockwise thread) that will fit most airsoft barrels with matching thread. Each barrel extension features a QD plunger type locking mechanism that slides onto the steel flash-hider and is pressed down locking it into place. A ratchet function helps tighten the barrel extension for a firm fit. This version of the barrel extension comes in a Tan finish making this suitable for desert painted rifles and is the long type extension, making this suitable for covering longer inner barrels. 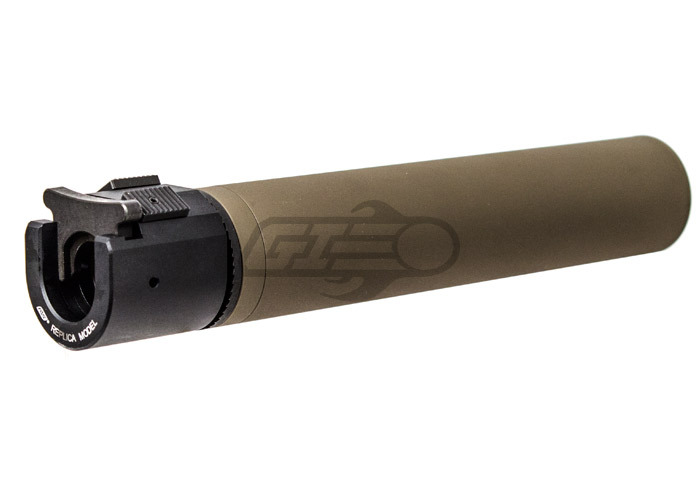 This is a very nice mock suppressor from ASG. It has nice weight, a good finish, and a mean look to it. Unfortunately this comes at a price that is higher than most. At just over $70, you should know what you are paying for. This suppressor weighs roughly two pounds(I did not have a scale, so this is an estimate), but most of the weight comes from the included flash hider and QD system. The aluminum is solid and nicely CNC'd at the end. Overall, a nice buy that will look great on any contemporary rifle platform. 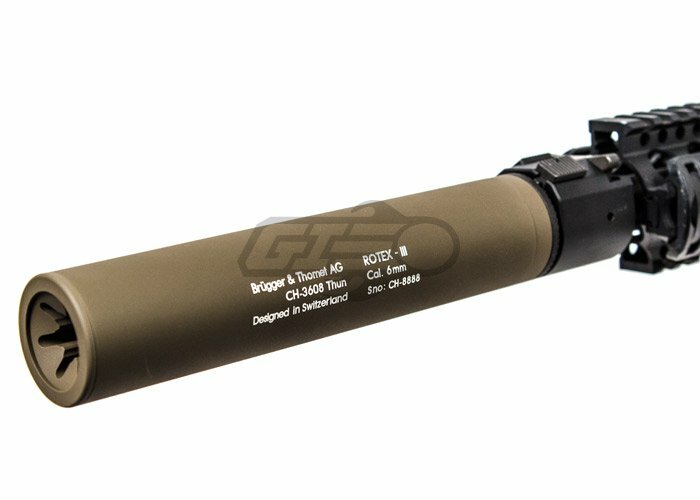 -Price: $70 is a lot for a mock suppressor. That said, most other sights that carry this one price them at around $85, and you can still use discount codes here. -Finish: this is just me getting picky, but it is much darker than most FDE-colored rifle parts. -Trades: although the trades are nice, I am turned off by them saying 6mm instead of 5.56x45. The barrel extension is pretty good, it fits on my g&g combat machine and the construction of it is flawless all around, except that it came in pre-opened and had rusted parts, it wasn't bad enough to the point where it's not usable, but it wasn't nice. This silencer looks good and has a descent build quality but had problems with the flash hider screwing onto the barrel and when it finally got on, wound up crooked, so I can't play with it now, also, the silencer and flash hider have a problem with the disconnect. Overall it looks cool but is frustrating and becomes a $70 aesthetic that only is usable as a wall decoration. Makes friends jealous of your stuff. Can't use in game play due to it being crooked. Yes, this should work fine for it. Will it for the asg amrmilite m15 s.i.r carbine rifle. It should fit most airsoft guns. This will fit your airsoft gun as well as others with a 14mm CCW thread. Yes, as long as the included flashhider is used, this item will be compatible with 14mm CCW threaded barrels. Does this have an inner barrel? No, there is no barrel within this barrel extension. The ASG suppressors do not have blaze orange paint on them, as they are not a airsoft gun. I would like to know the length of this suppressor. Its 222 mm if thats what you are wondering. Under "Specifications"<br><br> It is 8.75 inches long.